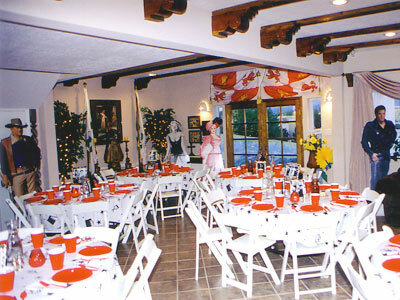 We have been offering "The Movie Star Dinner" for over 8 years, and it is one of our most popular offerings. We use a beautiful private home that features a lovely view of the mountains and unique southwestern artworks and furnishings. The solarium can seat up to 50 diners for a sit-down dinner and the upstairs deck affords a wonderful view of the sunset. 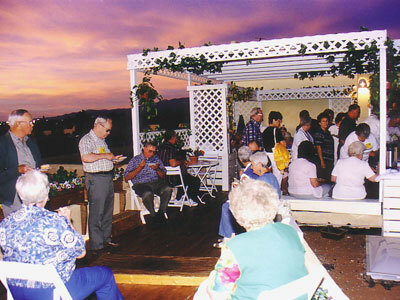 The deck is frequently used for dessert and coffee for our groups as they conclude their evening. 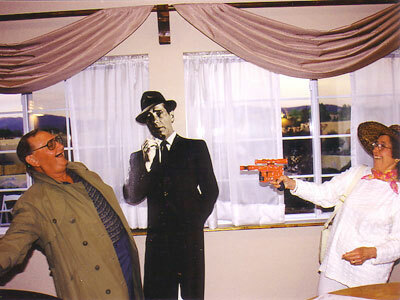 We have our own props for this event, which includes unique linens which feature movie cameras, film reels, and stars as well as center pieces and life-size cardboard cutouts of the following stars: Marilyn Monroe, Mae West, Laurel & Hardy, The Three Stooges, Roy Rogers, John Wayne, Humphrey Bogart, Elvis Presley, Clark Gable, and Vivian Leigh. The centerpieces feature black & white glossy photos of some of the most famous Hollywood stars of all time, and these photos are placed in beautiful silver frames. The guests are encouraged to guess exactly who these stars were, when the film was made, and the name of the film when it was released to the public. We own one of the original scenes from "Casablanca" and use that scene to set the stage for the group to participate in the "reading" for two crucial parts in the movie - parts played by Humphrey Bogart and Ingrid Bergman in the original film. We provide copies of the script to the "stars" who may keep them at the conclusion of the evening. Of course, the "stars" would actually be two members of your group that you would have pre-selected (but would be a complete surprise for the rest of the group). While the "reading" is going on, for a small additional fee, we can take photos for the group to have for their own enjoyment when they get back home. © Custom Tours by Clarice, Inc. 2019.